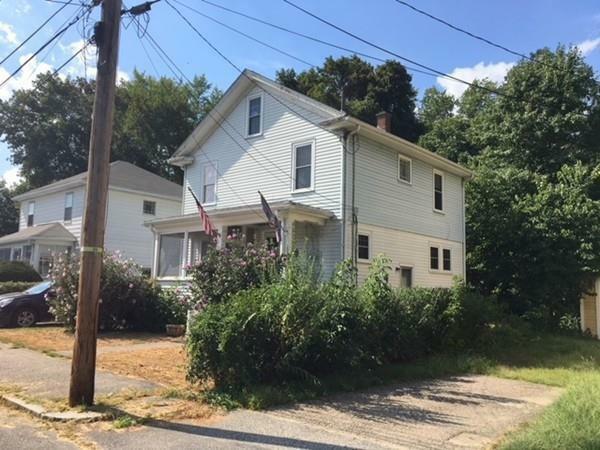 Classic, handsome, solid village colonial with charming front porch, sunny, bright, open front to back LR and DR combo, open to the eat-in kitchen, large windows, updated guest bath, large bedrooms, walk up attic for future expansion, hardwood up and down, gas heat. Perfect home for first time buyers, create fast sweat equity/ investor's project- selling as is- Refinish the nice hardwood, redo kitchen/ bath/ decor/ landscape. Big ticket items were done: roof- new, gas heat system- 1.5 yrs, updated windows, vinyl siding. Couple frozen pipes lead to replacement of the kitchen floor, foyer floor and updated guest bath. Great yard, one car, ended road, close to all major roads, library, shops.